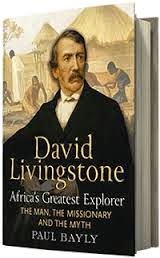 Livingstone was a Scottish missionary and one of the greatest European explorers of Africa, whose opening up the interior of the continent contributed to the 'Scramble for Africa'. David Livingstone was born at Blantyre, south of Glasgow on 19 March 1813. At 10 he began working in the local cotton mill, with school lessons in the evenings. In 1836, he began studying medicine and theology in Glasgow and decided to become a missionary doctor. In 1841, he was posted to the edge of the Kalahari Desert in southern Africa. In 1845, he married Mary Moffat, daughter of a fellow missionary. Livingstone became convinced of his mission to reach new peoples in the interior of Africa and introduce them to Christianity, as well as freeing them from slavery. It was this which inspired his explorations. In 1849 and 1851, he travelled across the Kalahari, on the second trip sighting the upper Zambezi River. In 1852, he began a four year expedition to find a route from the upper Zambezi to the coast. This filled huge gaps in western knowledge of central and southern Africa. In 1855, Livingstone discovered a spectacular waterfall which he named 'Victoria Falls'. He reached the mouth of the Zambezi on the Indian Ocean in May 1856, becoming the first European to cross the width of southern Africa. Returning to Britain, where he was now a national hero, Livingstone did many speaking tours and published his best-selling 'Missionary Travels and Researches in South Africa' (1857). He left for Africa again in 1858, and for the next five years carried out official explorations of eastern and central Africa for the British government. His wife died of malaria in 1862, a bitter blow and in 1864 he was ordered home by a government unimpressed with the results of his travels. At home, Livingstone publicised the horrors of the slave trade, securing private support for another expedition to central Africa, searching for the Nile's source and reporting further on slavery. This expedition lasted from 1866 until Livingstone's death in 1873. After nothing was heard from him for many months, Henry Stanley, an explorer and journalist, set out to find Livingstone. This resulted in their meeting near Lake Tanganyika in October 1871 during which Stanley uttered the famous phrase: 'Dr Livingstone I presume?' With new supplies from Stanley, Livingstone continued his efforts to find the source of the Nile. His health had been poor for many years and he died on 1 May 1873. His body was taken back to England and buried in Westminster Abbey.